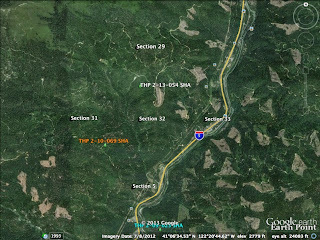 THPBlog: Roseburg Resources Company to clearcut log on steep unstable soils near Castella, CA. 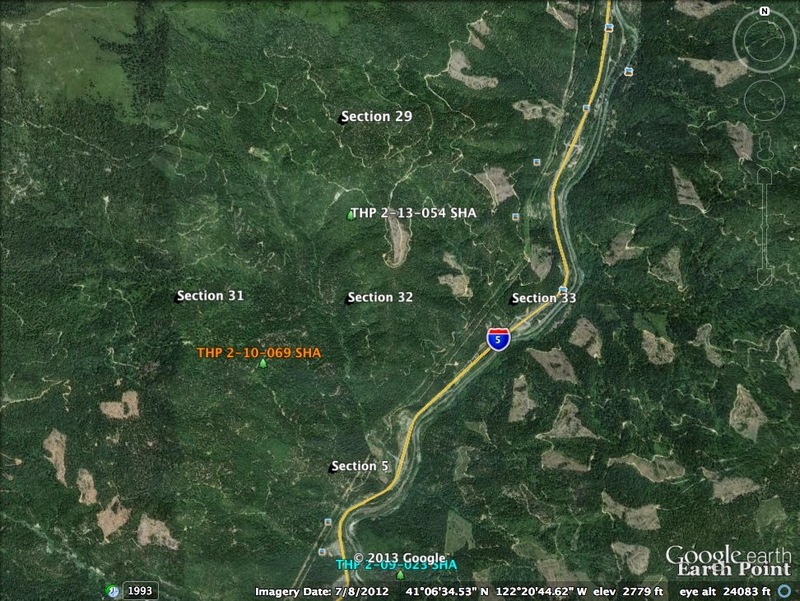 Roseburg Resources Company to clearcut log on steep unstable soils near Castella, CA. THP 2-13-054 SHA (Briar THP) Roseburg Resources Company, 198 acres; 92% clearcut, 6% selection, 2% roadside logging. Flume Creek, Sweetbrier Creek (MD: T37N R4W Sec.5; T38N R4W Sec.29, 31, 32, 33). Winter operations, high erosion hazard, steep roads, steep slopes up to 80%, landslide terrain, road failure sites, 57 road drainage work sites, herbicides, goshawk territory nearby, pacific tailed frog sightings, slender false lupine, trees up to 24" dbh. Estimated public comment deadline: 10/20/13. This THP is a couple miles SW of the town of Castella, CA and just west of the I-5 corridor in the Sacramento Canyon. Roseburg Resources Company is planning a mostly clearcut tractor and cable logging operation in Douglas fir, ponderosa pine, incense cedar, sugar pine, white fir and Port Orford cedar forests at an elevation of 1,760 to 4,160 feet. The THP area drains into the Upper Sacramento River and Into Shasta Lake and contains steep and unstable soils. There are 24 road related failure sites including cut bank failures, debris slides, fill failures, skid trail failures and steep head wall swale problems. Heavy equipment is proposed for use on an active earthflow to construct a road in unit 3201, and an existing skid road is proposed for re-use within an unstable area. In unit 2902, a skid road is planned for use on slopes that exceed 50% without flattening before reaching a watercourse, and tractors are proposed for use on steep slopes within all units designated for cable logging. There are 2 roads planned for use in a streamside area, and 250 feet of new road construction is planned on steep slopes exceeding 65%. 57 road drainage sites are planned for work including rocking, dip construction, ditch cleaning and culvert maintenance. Plant and wildlife sightings include; pacific tailed frogs were reported in units 0102 and 1103, rattlesnake fern was found in the NW quarter of Section 5, California Lady’s slipper was found in the NW quarter of section 31, and slender false lupine was found near a haul road. More information is available on the THP Tracking Center website.